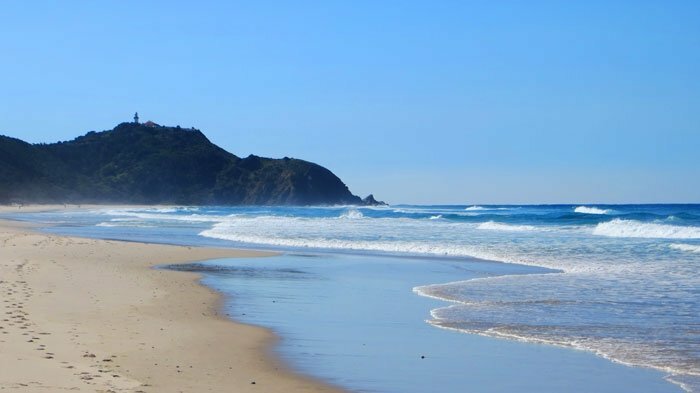 Welcome to Byron Bay, one of Australia’s favourite tourism destinations. Hippies and “dole bludgers” originally came here in droves in the 70’s and 80’s as refugees avoiding a mundane 9 – 5 life. Today those hippies have grown up and creating with them a bunch of creative, eco-friendly and high quality tourism attractions and eateries that are unmatched on the NSW coast. Somehow I’ve avoided coming here before. So I’m going to make up for lost time and make the most of my few days here on the next leg of my Australian East Coast Road Trip. If only all accommodation places could be like this. 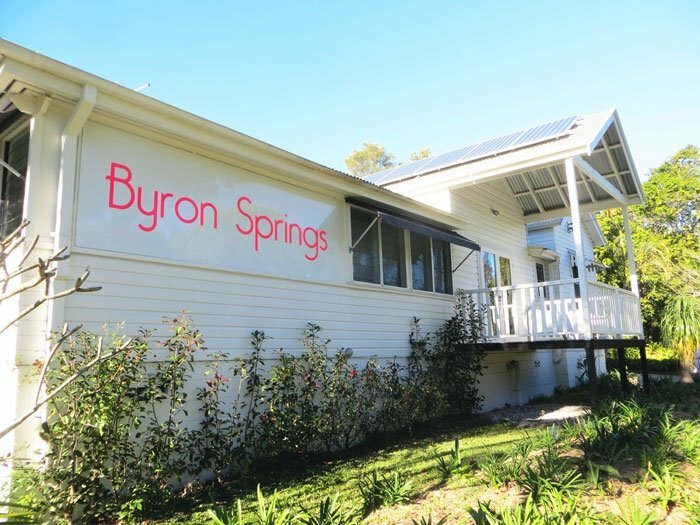 Byron Springs is a former dairy that has been lovingly restored by owner / manager Susie. 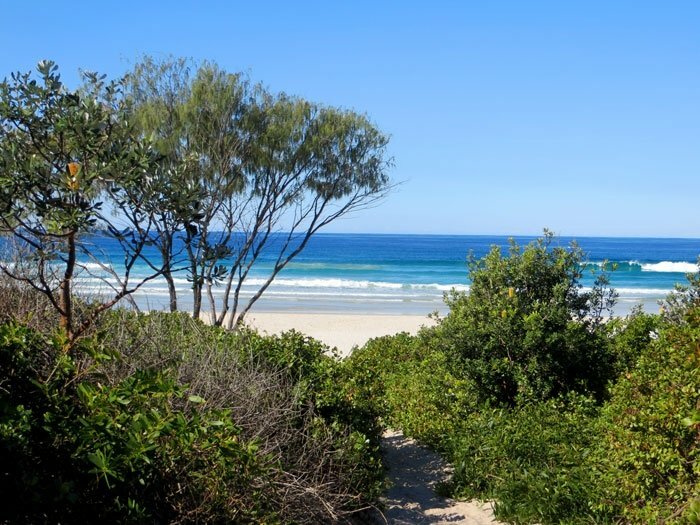 When you arrive here, Susie’s passion for her guest house and Byron Bay is evident. Expect to be quickly be sat down and made to feel at home right away with friendly tips, a cup of tea and quick tour of the facilities and introductions to any other guests that might also be there. I wrote “home” in the heading and I mean it. Byron Springs really does feel like a home away from home. One of the best things about Byron Springs is it’s proximity to the beach. I’m not talking about the crowded main beach in town either. Less than a 5 minute walk from Byron Springs you are in Arakwal National Park, and it’s lengthy scheduled beach and bird watching ponds. If you’re an early riser than a jog along this beach is the perfect way to start the day. With one of the first sun-rises in Australia happening just off shore. I expected just to take a quick 5 minute walk to check out the beach and get my bearings. But instead I spent about 45min to an hour walking along the sand to the foot of Cape Byron and the magnificent lighthouse. Miss Margarita – California in Byron. I was pretty happy to find myself in town at the end of the beach walk , because Byron is home to a quality range of unique eateries that a town of this size is very lucky to have. First one to try out (on Susie’s recondition of cause) is Miss Margarita . Good mexican (in my opinion) three things. 1. Fresh ingredients 2. Fun Atmosphere 3. Well made margaritas with the house’s own unique recipes. You will find all three of these in bucket-loads at Miss Margarita. While I wasn’t quite ready for margaritas after a long walk in the sun. I well and truly tested out the freshness of the food and the fun atmosphere. 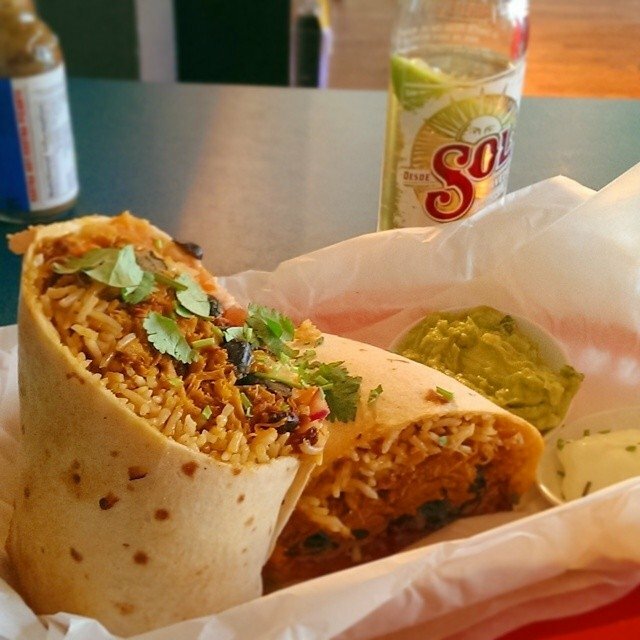 Pulled Pork Burrito and Sol from Miss Margarita. Now for something I suggest you don’t do unless you are over 45. Open Mic night at the Beach Hotel. If you’re not familiar the concept is simple. 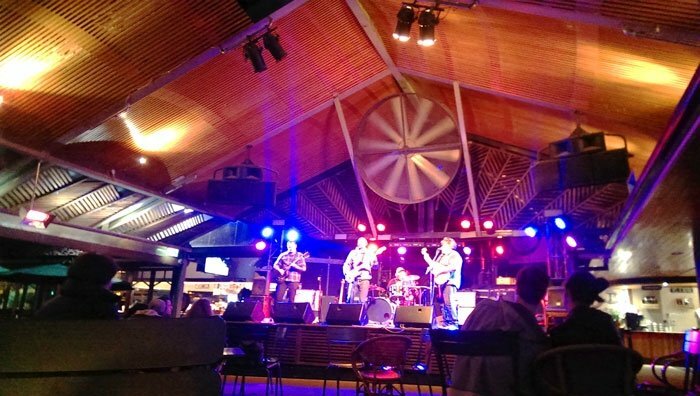 Anyone can get up on stage at this large pub and perform for the crowd. In this instance it was a bunch of local bands. It was easy to see who was popular and who wasn’t as the crowd fluctuated dramatically witch each band. The guys pictured above were actually great at belting out some rock classics including a sensational rendition of Credence Clearwater Revival’s “Out My Back Door”. It was a real pleasure to see some ordinary guys singing with smiles on their face loving being in front of audience. Their CCR track got a bunch of 50+ Canadian ladies up, shaking and moving on the dance floor. I think the song got them a little too excited as one then decided to join me at my table and got a bit too touchy feely for my liking. Lesson learnt – when the seniors start dancing it’s time to leave. Sea Kayaking with all Dolphin’s, Whales and Turtles. If you’re going to thrash yourself splashing around the ocean then why not get up and close to some animals as well? 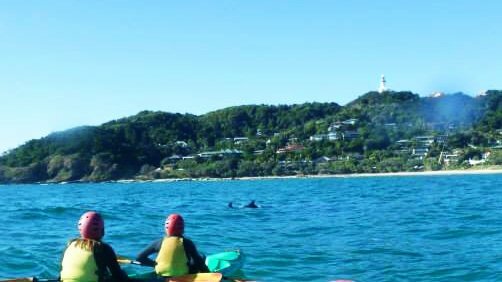 There are a number of sea kayak operators in Byron and they all offer you a free trip the next day if you fail to see dolphin’s or turtles – which is rarely. I say thrash yourself, but it’s actually easier than it looks. If you’re not as fit as you should be, then the instructors will happily take you on their kayak and you can sit back and enjoy the ride. It was only 10 minutes when we saw our first pod of dolphins. With everyone just still we could just drift and watch them play as close as 10m from us. Some even jumping out of the water putting on a show. What else is cool? The instructors take out a waterproof camera so you won’t miss out on capturing your close encounters. A quick break on Wategos beach for Tim-Tams and Milo (what else would you have in Australia) and it was time to head out on the ocean again . This time Whales were on the horizon while dolphin’s were only 10m in front of us. Being able to see two of the ocean’s most fascinating mammals in the one view shot was sensational. It got better when two of the dolphins started to come closer to the kayaks to explore. Getting as close as 5m before two kayaks hit together and the banging noise scaring them away. Oh, Almost forgot that an turtle made an appearance too. An old fella popped is head up for air above “turtle reef”. They are big, this one with a shell diameter of about 2 metres. Other’s are in the vicinity of 3m and 200 years old. I did my trip through Cape Byron Kayaks. They were very professional and very fun to kayak with. 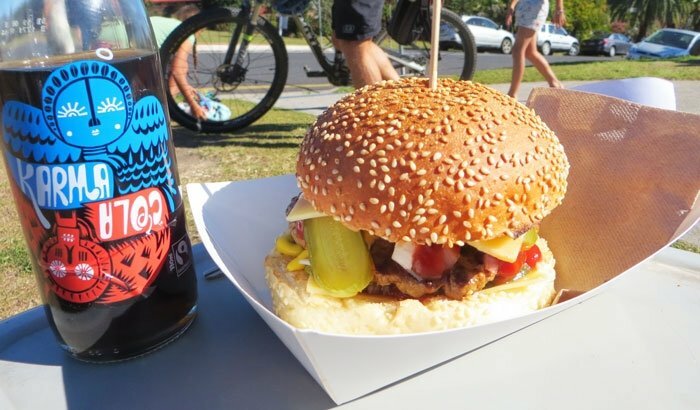 Top Shop – Better than crappy clothes – they make epic burgers! I’m quickly discovering that Byron is full of surprises, and here is the first major one. Top Shop. Located on a street corner in the middle of suburban Byron you will find Top Shop, a former corner store now a burger bar. 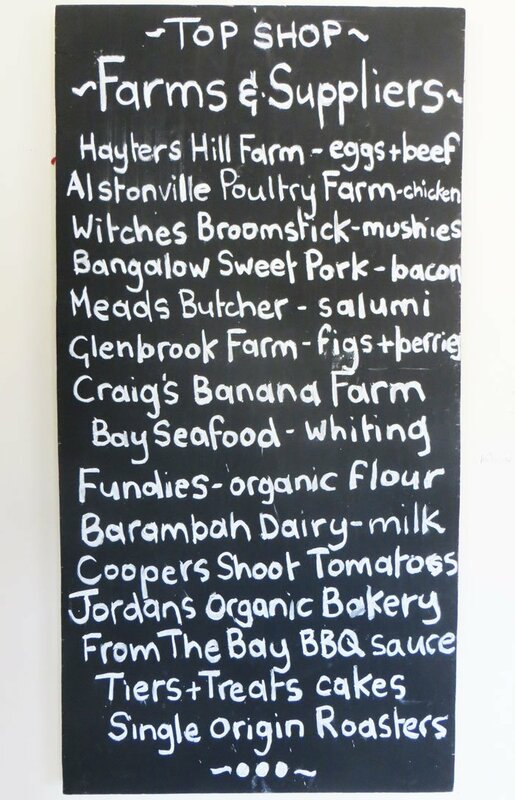 The team here use locally sourced whole-food ingredients that result on a high quality product. You know it’s good as even though it’s in the middle of nowhere the nature strip is covered with people lying in the sun enjoying their burgers. Despite its popularity the service is good and quick. Before I forget, they made one of the best coffees I’ve ever had – A big call considering how seriously I take my coffee. To be continued with more Byron Bay including the Lighthouse walk, Hinterland and Roadhouse Whiskey Bar. This entry was posted in Oceania, Travel and tagged Australia, byron, byron bay, dolphins, marine life, NSW, road trip, travel, whales. Bookmark the permalink.